Traditionally, scholars have used Hagley to study the history of business and technology, but in the 1990s, they have begun to use Hagley's collections to examine such issues as gender and the workplace, domesticity, female entrepreneurs, engendering business, gender and consumption, and fashion in the women's clothing industry. 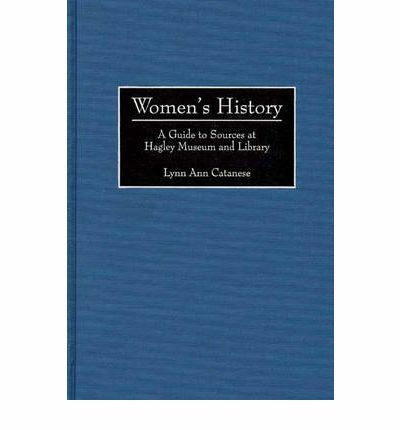 This guide reinterprets the Hagley collections within the context of women's history, making them more accessible to researchers in Women's Studies. The volume describes over 300 manuscript, archival, and pictorial collections, covering in six topical chapters such subjects as 18th and 19th century women in France and America, the leisure class, employment and entrepreneurship, the culture of consumption, and benevolence, reform, religion, and politics. The volume opens with an introductory essay tracing the changes in historical literature and describing the ways in which Hagley's collections speak to recent scholarship in women's history. Each of the six topical chapters opens with an introduction relating the relevant collections to the historical literature and then provides detailed series descriptions, including collection name, inclusive dates, quantity and accession number, a historical or biographical sketch, and a scope and content note.